The Celtic legend of Ys tells the tale of a majestic, Atlantis-esque city swallowed by the sea, a tale that’s been reimagined over centuries to gain new allegorical depth. The latest retelling comes courtesy of graphic novel publisher First Second in 2020, partnering National Book Award-winning writer M.T. Anderson and artist Jo Rioux for The Daughters Of Ys, which combines intriguing family and political dynamics with lush illustrations that imbue the story with personality and spectacle. Anderson released his first graphic novel, Yvain: The Knight Of The Lion, in 2017, adapting Chrétien de Troyes’ 12th century epic poem about an Arthurian knight with striking artwork by Andrea Offerman. Anderson has a talent for taking these classic stories and making them feel fresh and relevant for contemporary audiences, and he takes to the comic-book medium very well, giving his collaborators plenty of room to carry the storytelling with their distinct points of view. This exclusive first look at The Daughters Of Ys, on sale May 12, 2020, introduces readers to King Gradlon and the mystical Lady Malgven, who uses her magic to create the city of Ys after Gradlon kills her wizard husband. Gradlon and Malgven’s daughters are the central characters of the graphic novel, and the conflict that arises between the two young women drives the plot and leads Ys to its doom. 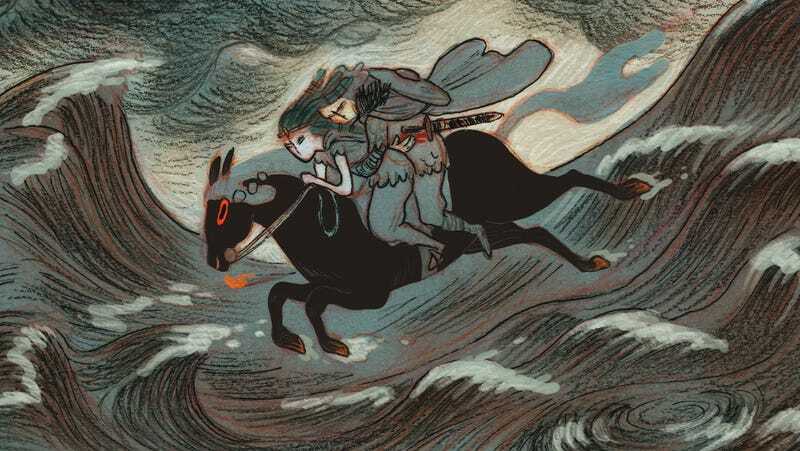 This excerpt establishes early on the importance of the sea in the narrative, and the image of Gradlon and Malgven riding a black horse across the ocean connects the lovers to the water while foreshadowing major events later in the book. There are some great small touches in the artwork, like the contrast of Malgven’s graceful, untarnished hand with Gradlon’s bloody palm, and the red of the blood segues into a heated palette when Gradlon attacks the wizard. Rioux’s visuals intensify Anderson’s script, and these pages are just a small taste of the stunning artwork in The Daughters Of Ys.